In light of a 14.2 percent increase in pending sales, Twin Cities home buyers seem unphased by recent mortgage rate increases. Even with rates around 4.5 percent, the housing stock remains highly affordable by historical comparison. In 25 of the past 26 months, there have been year-over-year gains in pending sales; and the metric is currently at its highest level since June 2006. House hunters are watching seller activity for clues of additional inventory.New listings rose 20.0 percent, the second-largest gain since March 2010. Buyers have 15,193 properties from which to choose – 17.2 percent fewer than in June 2012 but 17.4 percent more than in January 2013. The median sales price for the metro area rose 17.5 percent to $210,000. 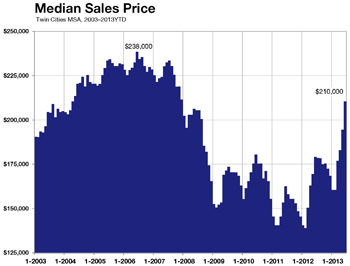 That’s the highest median sales price since December 2007. A shift in sales types is driving this price recovery. As recently as February 2011, foreclosures and short sales comprised 61.5 percent of all sales activity. In June 2013, these two distressed segments together comprised just 21.7 percent of all sales. On the seller side, the percentage of all new listings that were distressed in June fell to 16.8 percent, its lowest level since September 2007. Seller activity was up 20.0 percent overall, but traditional new listings surged 44.4 percent. Foreclosure new listings decreased 24.6 percent and short sale new listings fell 51.7 percent. With 16 straight months of year-over-year price gains, multiple-offer situations and just 3.5 months’ supply of inventory, the same market that recently favored buyers is now tilting toward sellers. Looking at price movement by segment, the traditional median sales price rose 8.7 percent to $232,000; the foreclosure median sales price was up 16.9 percent to $145,000; the short sale median sales price increased 14.2 percent, also to $145,000. On average, traditional homes sold in 68 days for 97.7 percent of original list price, foreclosures sold in 71 days for 98.2 percent of original list price and short sales lagged at 156 days and 93.0 percent of original list price.